I typically work with very young learners in Early Intervention but there was a time I was working with older children, which necessitated work on conversation skills and topic maintenance. With the start of a new academic year and changes to my caseload I am currently finding myself with students who again need some assistance in this area. Children with autism spectrum disorders often struggle in conversations because of limited or restricted interests, attending issues, difficulty determining what is relevant or salient to the topic and might also struggle with the rapid transitions necessary to shift between speaker and listener. This change in my caseload has meant that I’ve found myself digging into old files and unearthing some ancient DIY efforts of mine that I had used in the past. What I came across that I wanted to share was a visual support that I had used in small groups to facilitate a variety of skills. 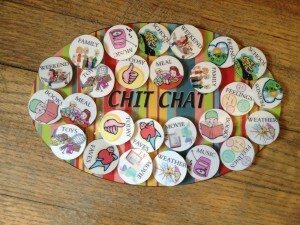 It’s something I called Chit Chat and it helped to cue the students in shifting from speaker to listener while maintaining a balance in the conversation with turn taking and reciprocity as well as staying on topic. The idea was that we would all sit down for a “chat” and initially I would go first in order to model how the board was used rather than providing explicit instruction until the group could use the board on their own and I could fade myself out of the conversation. The first speaker would choose a token corresponding to a topic of interest, make a statement relevant to the topic chosen and then pass the token to a friend. The token would provide a prompt for the speaker to maintain the chosen topic as well as cue the rest of the group to visually reference the child whose turn it is to be speaker. Depending on the level of the group I would individualize the number of conversational exchanges on one topic required before bridging to a new topic. The group I was working with at the time was able to talk about more general topics but this could be individualized to more specific topics depending on the group of students you are working with. I’m excited embarking upon a new academic year with all it’s unique challenges and successes and am happy to dust off Chit Chat and give it another whirl this year with all new students. I would be curious to hear from other educators and therapists what tools they’ve created that they find themselves going back to year after year. You might be surprised what you find at the bottom of your file cabinet! Also, check out this great link I stumbled across from POPARD Provincial Outreach Program for Autism and Related Disorders in British Columbia, Canada. Written by: Stacy Asay on November 14, 2012. Last revised by: Different Roads to LearningOctober 16, 2018. This entry was posted in ABA, autism, autistic spectrum disorder, Do It Yourself, Social Skills and tagged ABA, Applied Behavior Analysis, autism education, autistic spectrum disorder, conversational skills, generalization of skills, language development, social skills by Stacy Asay. Bookmark the permalink.